Did you know? 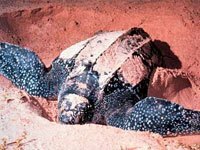 The largest leatherback ever found was an 8.5-foot-long (2.6-meter-long) male weighing 2,020 pounds (916 kilograms) that washed up on the west coast of Wales in 1988. 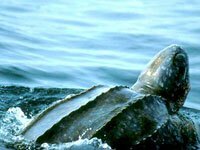 What is a leatherback turtle? The leatherback turtle (Dermochelys coriacea) is the largest of all sea turtles. 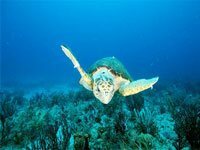 The shells alone can reach 1.6 metres long and the turtles can weigh a massive 500 kilograms. 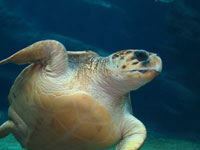 The unusual shell and the relatively large shoulders and huge front flippers make them look almost like weird sea monsters and they are the fastest swimmers of all marine turtles. What does a leatherback sea turtle look like? The leatherback sea turtle has quite an unusual appearance compared with other turtles, as the shell is leathery and largely blackish in colour with five distinctive ridges that run along the full length of the shell. The black shell and other parts of the body have a smattering of light spots. The leatherback differs from other sea turtles in that it has a leathery shell and flippers without claws. Where do leatherback sea turtles live? Leatherbacks have the widest global distribution of all reptile species, and possibly of any vertebrate. They can be found in the tropic and temperate waters of the Atlantic, Pacific, and Indian Oceans, as well as the Mediterranean Sea. Adult leatherbacks also traverse as far north as Canada and Norway and as far south as New Zealand and South America. What does a leatherback sea turtle eat? Leatherback turtles feed mainly on jellyfish and other soft bodies marine animals such as squid. 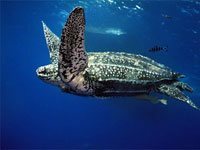 What are the natural enemies of the leatherback sea turtle? Leatherbacks are currently designated as endangered under the U.S. Endangered Species Act. The number of leatherbacks in the Atlantic appears to be stable or increasing, but the Pacific population is declining at an alarming rate due to egg harvest, fishery bycatch, coastal development, and highly variable food availability. Some Pacific populations have disappeared entirely from certain areas, such as Malaysia. Download free Leatherback Sea Turtle wallpapers, click on the image to open the large version. Print free Leatherback Sea Turtle coloring pages, click on the image to open the large version.